Another Dark Vengeance miniature is finished. I am really enjoying painting this set, the models are all fantastic. My one criticism of Turmiel is that he is perhaps a little too detailed. This made painting the model a bit of a challenge as there are a lot of different bits to paint and I wanted to avoid using too many colours as I didn’t want the model to become a confusing mess or look like an explosion in a paint factory. For this reason I used a lot of neutral colours for the details in order to allow the blue to really stand out. 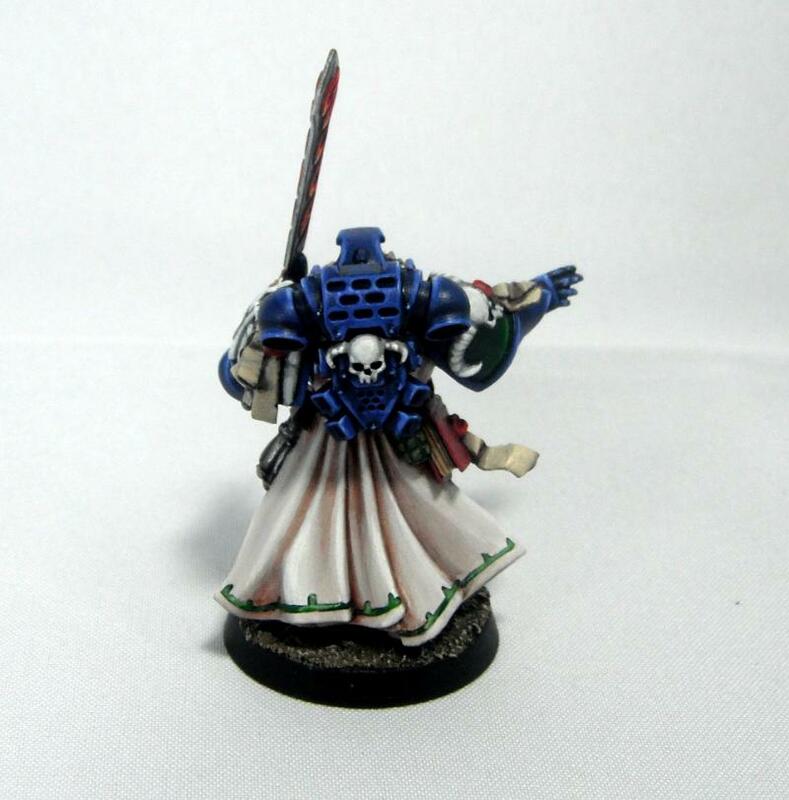 My other concern when painting this model was that he fit in with the look of the rest of the force despite wearing the livery of a librarian rather than the dark green armour of his brethren. 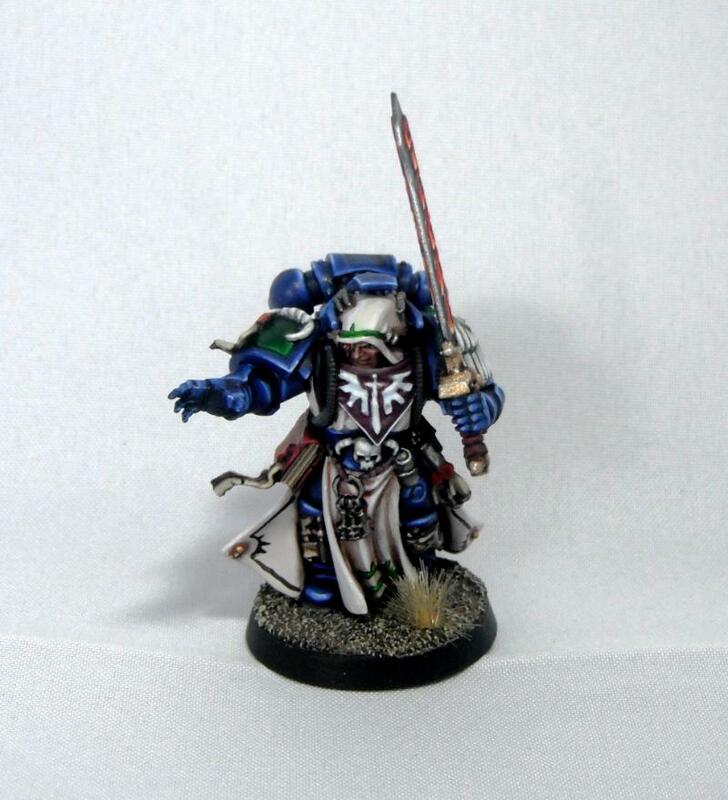 In order to achieve this I used a very dark blue (Regal Blue) as the basecoat and used the same edge highlighting technique I used on the tactical squad. 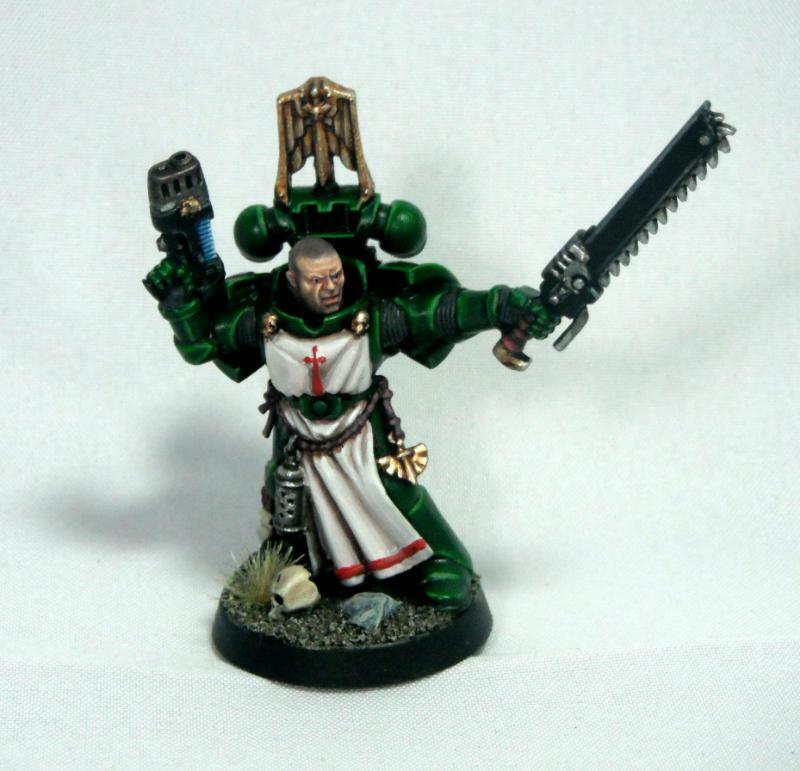 In addition to this the robes are painted to match Raphael and the Deathwing terminators and details such as the shoulder pads and embroidery on the robes are picked out in green. Hopefully he will fit in with the rest of the army while still remaining unique. The force sword was another area that gave me a bit of trouble. Initially I painted the pattern on it blue but this ended up too similar to the rest of the model. 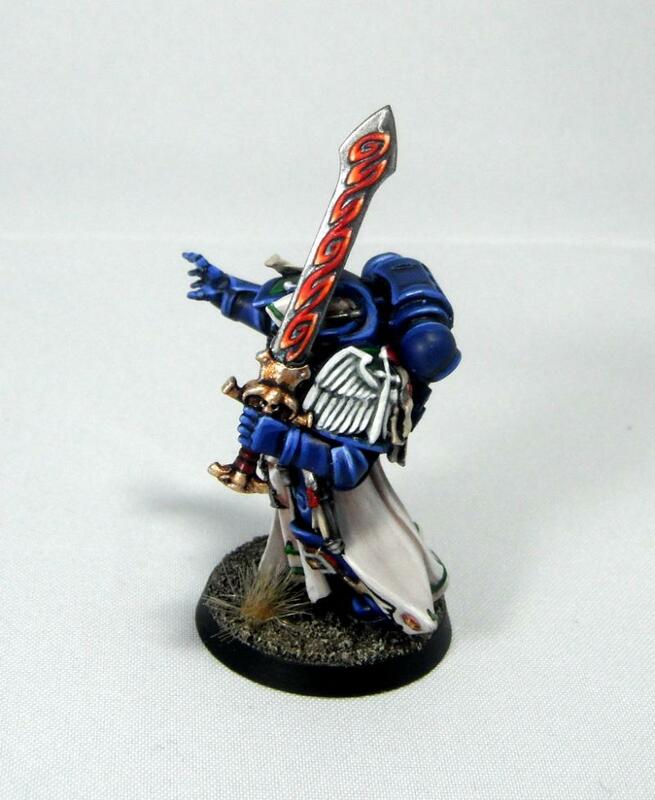 Instead I opted to go for an ‘old school’ look and paint the sword with a red pattern. I think there is enough red elsewhere in the army that this works. I game terms I’m not sure which psychic discipline to give him. I may opt for ‘Divination’ or ‘Biomancy’ as I like the idea of psychic powers that can enhance other units in the army or debilitate the enemy rather than simply destructive ones. I’ll give this a bit more though once I’ve read through Codex: Dark Angels which I plan on purchasing at the weekend. I’ve finally put the finishing touches to Sergeant Raphael from Dark Vengeance. Here he is in all his glory. For more insight into the painting process check out my earlier work-in-progress post. Happy New Year everyone! December was a fairly slow month for me hobby-wise with Christmas, New Year and family visits occupying much of my time. 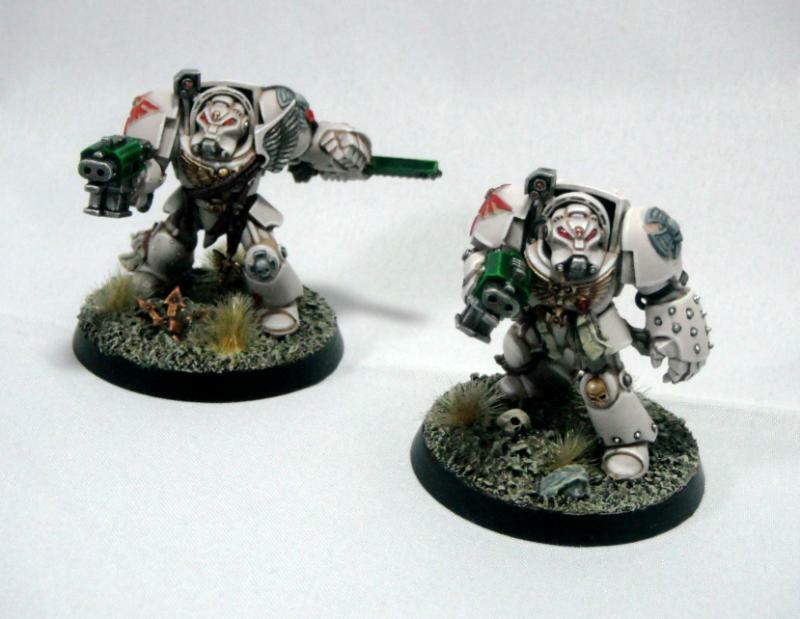 However, I am now getting back into the swing of things and have completed my first two Deathwing terminators from Dark Vengeance. The colour scheme is essentially the same as I used on my Saruman model, showing the different results that can be achieved using the same colours. As with my other Dark Angel models I used hard edge highlighting (rather than the gradual blending on Saruman) which I think works really well on power armour. 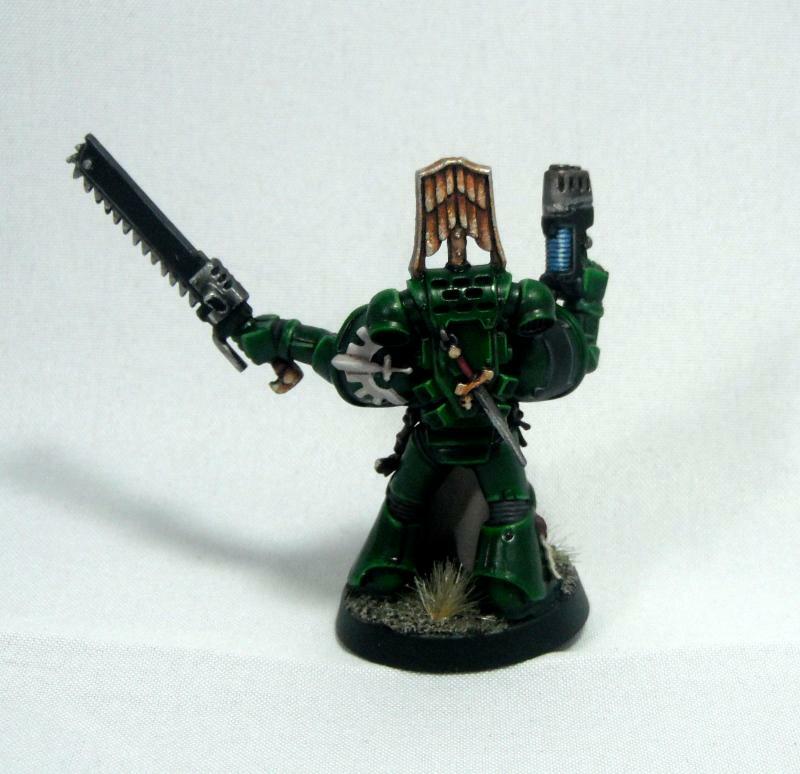 The sharp highlights also help to tie them in visually with the green tactical marines. 1) Over a white undercoat apply a basecoat of Dheneb Stone. 2) Shade using Vallejo German Camo Pale Brown (a great colour that could have been invented for shading Dheneb Stone). 3) After tidying up the Dheneb Stone highlight with Pallid Wych Flesh. 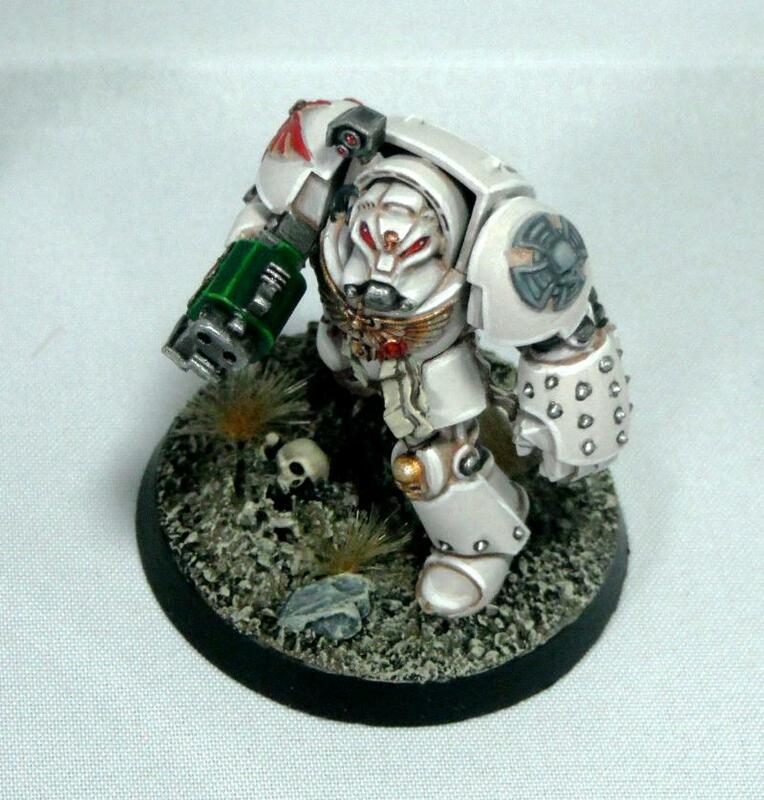 4) Apply a final edge highlight of White Scar. The model with the chainfist was actually painted before buying Pallid Wych Flesh using a 50/50 mix of Dheneb Stone and White Scar for stage 3. However, Pallid Wych Flesh is more or less the same. It is slightly paler but this is hardly noticeable. The advantage of using Wych Flesh is that I don’t have to mix paints anymore allowing me to get a more consistent finish across the squad. 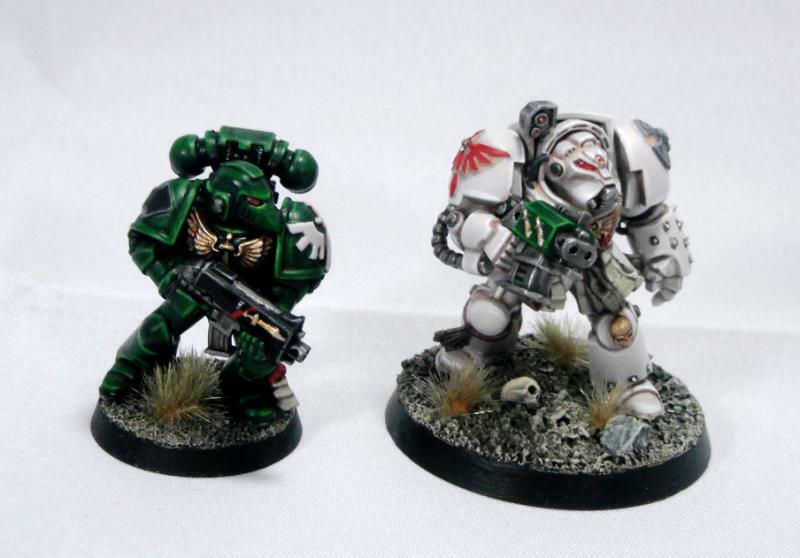 One of my fears when it came to painting a Dark Angels army was the different colours used by the units in the army. I was initially worried that this would end up resulting in a lack of consistency across the army and this was something I thought long and hard about trying to avoid. In the end I decided to use the same dark green as my tactical marines for the weapon casing to tie them together. 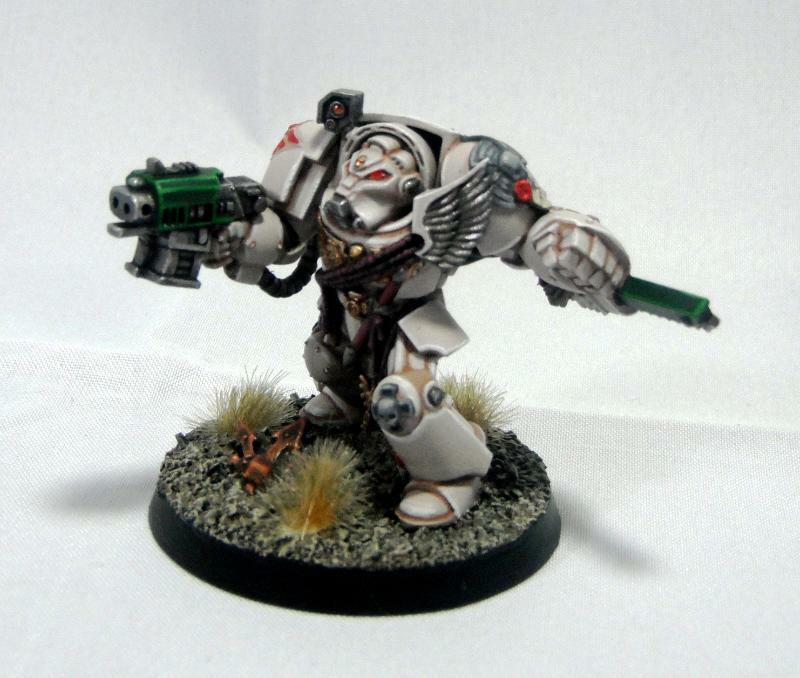 I also painted details such as the eye lenses, purity seals and chest eagles exactly the same was as on my marines to further reinforce this sense of coherency. 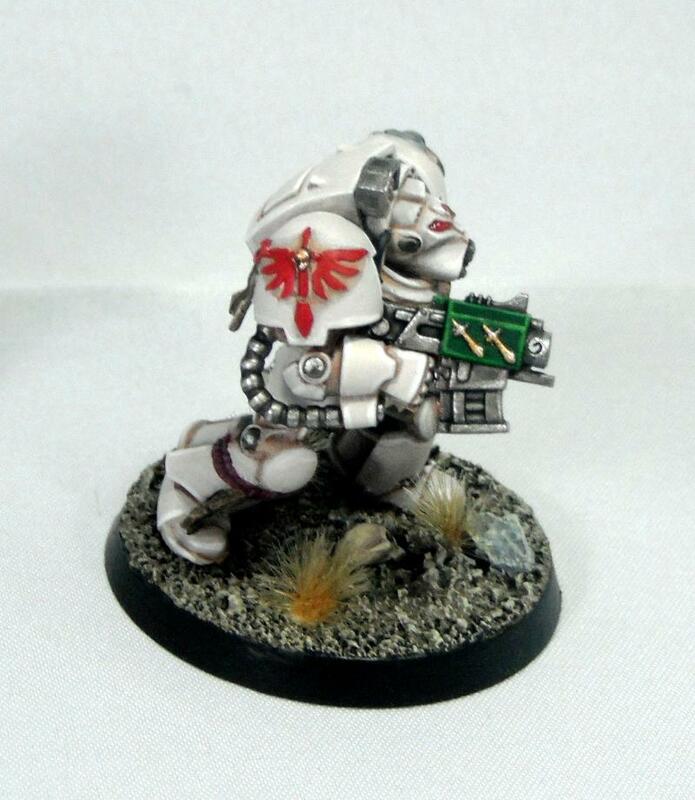 The chapter icons and robes on my other models are painted Dheneb Stone and highlighted up to White Scar to match the terminator armour.